Roasting and barbequing are some of the oldest and healthiest options of cooking chicken, lamb, beef, venison and the like. In fact, this is how our ancestors had begun their venture in the crude form with cuisine right from the prehistoric days. Over the course of the millenniums though, recipes have evolved just as much as the human race, but with lesser devotion to health and more inclination on enhancement of taste. This is one of the reasons that has also lead to compromising the health factor of these otherwise nutrition-packed alternatives. 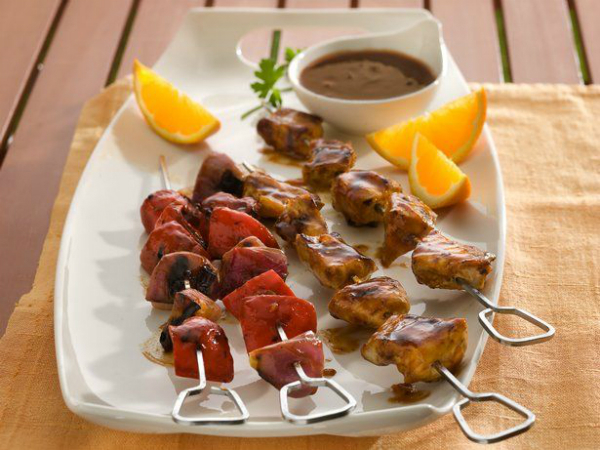 Ingredients for this lip smacking recipe includes… 4 pieces of boneless chicken breast amounting to 5 ounces; 1 tablespoon olive oil, 1 ½ cup barbecue sauce; ½ cup finely chopped green pepper and onion, ¼ teaspoon black pepper and salt to taste. It is advisable to use low sodium salt no more than ½ teaspoon. Process – Take a saucepan and heat the oil on low flame. Cook the onions and green pepper in it till it softens followed by the barbeque sauce. Mix till the contents blend which will take about 2 to 3 minutes. Marinade the chicken in 1 cup of this sauce keeping away the rest, and refrigerate for an hour or two. Longer the marinating better the flavors will be. Bring out the chicken after marinating it and place it on a greased grill and cook for 10 to 14 minutes (depending upon the heat). Serve with the remaining sauce and enjoy! Calories – 190 per serving. Ingredients – 5 ounces boneless chicken breasts; 1 cup extra virgin olive oil; ½ cup minced garlic; fresh herbs of choice (thyme and oregano is recommended); ½ tablespoon lemon zest; ½ teaspoon pepper. Process – Mix the olive oil, garlic, herbs and the lemon zest in a container of your convenience and dip the chicken breasts completely and evenly in the mixture. Keep marinating for 1 to 2 hours or more as required. Cook on preheated grill for 6 to 10 minutes till cooked. Serve and enjoy! Ingredients – 5 ounces of boneless chicken breasts; 2 lime; ½ teaspoon crushed cumin; ½ teaspoon smoked paprika; ½ teaspoon black pepper; ½ teaspoon garlic salt; ½ teaspoon salt to taste. Process – Mix the dry ingredients and sprinkle the seasoning evenly on both sides. Squeeze fresh lime juice (1lime) in to the content, mix evenly and let the mixture rest. When you are ready to eat, bring out the contents and grill them for around 5 to 8 minutes till cooked. After removing from grill, squeeze the 2nd lime on the chicken. You can slice the chicken and serve between tacos or ditch the tacos and team up the recipe with boiled seasoned vegetables for a healthier and lower calorie chicken alternative. Why not drink wine? Find out 6 cool reasons!